Although these words shouldn't appear in a paper, that doesn't mean that they should never be used. How could I write a cover letter without using the words "I" or "you?" That's still formal writing that goes through a lot of editing. I enjoy writing papers because most of the time, it gives me an opportunity to learn something new and gives me more practice with editing. Sometimes, I feel that the prompt does not allow for this. For example, I had to write a paper this semester that stated the author's argument in less than 750 words. The prompt stated that the introductory paragraph was to tell the reader what I would do in the paper. I cringed because I've been taught for years that this was improper, but I wanted an A, so I sacrificed my own standards. I still received a C on the paper, which I thought was harsh for someone who wasn't an English professor and assigned such a poor prompt. This blog entry is different because it's supposed to be like a diary that everyone can read. It gives me a chance to formulate my thoughts and hope I can enlighten others. I would have to consider that anyone can read this, which is why I didn't give the name or class for the paper I mentioned earlier. I also have to conform to standards for this blog, which, in some cases, means I have to sacrifice doing what I think makes sense. In this case, it would make sense not to include a random link, but it's required, even though this post doesn't call for one. It also doesn't call for pictures since I'm writing about words, but here are some pictures of my French essay that I finished at 1:30 the night before it was due. It's pretty obvious that I was just trying to meet the minimum word count because the essay is full of weird stuff that came to my head at that hour. Again, something I would never write for an English class, but I got an A.
I would be able to use magic to create money (professor's comment: and to get out of prison?). I wouldn't need to use a car or pay for gas because I could transport myself with magic. If I want to earn a living, it's important to be frugal. It would be cool to be a magician. I would have a career that's cooler than all the other students at Clemson. Engineers wouldn't be able to travel the world while working. I wouldn't need to study to become a doctor because I could use magic instead. They would be so jealous, but they might be less jealous if they turned into happy frogs who could walk on land and swim in a lake. It's a life that would be less complicated for everyone! I like your list of words at the beginning. We are taught as writers to be concise, clear and mindful of the words we choose to use. While a word is just one of many in a paper, story, etc., it shouldn't be overlooked. It is our duty to pay attention, and by doing so, we make it easier on the audience. You made good points about how there are different ways to write, and how having a public audience does change the information you give. It is definitely a good thing to be a aware of when writing. It is also important to work on all the different types of writing, which is something I don't think modern education covers very well. We are taught on how to write literary and informational essays but we are not taught about cover letters, resumes, etc. 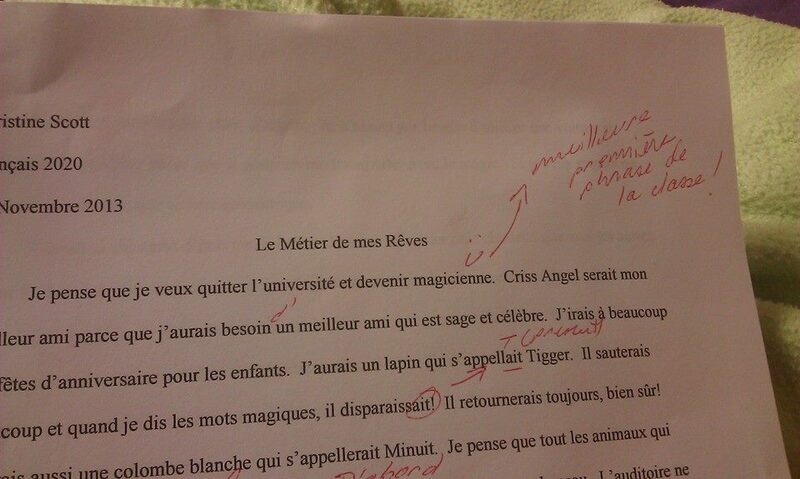 Your french paper was really funny! I also cringed when I read that your teacher wanted you to tell the reader what you were going to to in the first paragraph. Do writers even really do that anymore? Also, thank you for the link that you posted. I needed a good laugh today! Hey I loved how concise your vocab was. I also agree there are many different ways to write and they are each good in there own way. 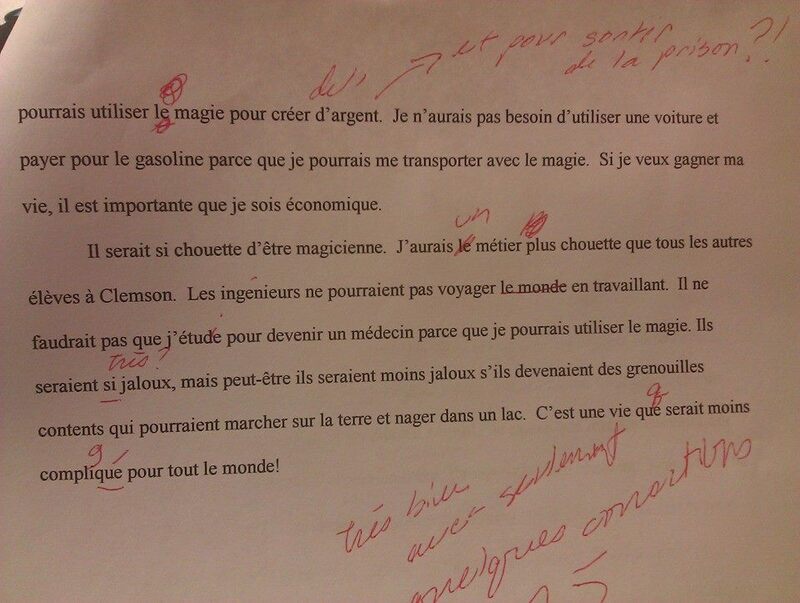 Last/y your french paper was so funny! I loved it! I completely agree with what you're saying, it's hard to adapt for the different audiences you are writing for. The red pen marks on your paper are scary and I have no idea what they're saying but I'm sure you did great on your paper. The text below the image is the translation of what I wrote, and it's pretty weird. Hi Christine - I think you made some great points here about the different standards we adopt for public and private writing. I especially like how you pointed out that our own personal standards of writing (such as your views about the proper way to construct an introductory paragraph) don't always coincide with what a professor expects. In those situations, it's usually necessary to yield to the professor's wishes, and allow our own writing style and "personality" to come out through alternative writing opportunities, like blogs or social media. Great insights - thanks for sharing!